Some background first. 4AD is a solo RPG game created by Andrea Sfiligoi, where the player controls a party of four characters that move through a randomly generated dungeon. Since its initial release, a number of supplements have come out. First was Caves of the Kobold Slave Masters, and then Dark Waters, both of which will kick off first level parties through to the third level. The next release was The Three Rings, which is for third to fifth level characters, so a logical progression for parties that moved through one of the previous supplements. Though the 4AD base game itself can be applied to any world or background, the supplements have theming, being set in the world of Norindaal, which is the official world of Song of Blades and Heroes. 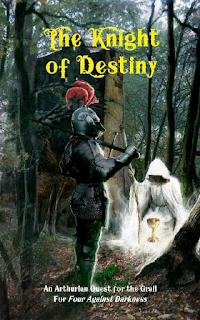 The Knight of Destiny applies the game system to a medieval Arthurian world, where a single character (a starting 3rd level paladin) heads out from Camelot on a quest for the grail. It is set in the outdoors, so there is no dungeon generation or map making. The main inspirations are Malory's Le Morte d'Arthur, the John Boorman's 1981 Excalibur film, and even a good dose of Chaucer's Pardoners Tale! During the adventure, the paladin will come across a whole menagerie of creatures and characters, some benign, others not so. An important concept in the game are inns, it is here where the paladin can rest and listen out for rumors to help in the quest. Retainers can also be hired at inns; they will bring with them various skills (that the paladin does not have) to help on the quest. Another key concept is piety; at various points in the game, the paladin will have to make life threatening or moral decisions to succeed, as only the most righteous can find the grail. While the paladin is busy questing, a larger story develops in the background where the evil and traitorous forces led by Morgana and Mordred will grow in power and try to defeat King Arthur. There is a role reversal for the player here, as the paladin can shift from being the hunter to the hunted, as increasingly powerful knights (bosses) will try to stop the grail from being found. My aim was for The Knight of Destiny to provide a solid challenge, and be random enough for it to give a different game/experience every time it is played. My success rate in playing is somewhere below 50% - so finding and returning the grail to Camelot is not that easy! The randomness is brought about by a number of tables, similar to the 4AD base game approach where there is no scripting. Anyway, I hope this a good addition to the 4AD family, taking the system into a semi-historical / mythological background. Hello! A nice premise I'm looking forward to enjoying. 1. How many pages has the book? 2. Since there are no rooms, is the characters' progression in the story based solely on chronology on a "Time Track" (ex. 20 days' worth of events before the game ends), or Something else? 3. How replayable is this book? Could it be used for repeated adventures, with different character types? 4. Is it possible to use hexmaps for this supplement, as a hexcrawl-style game? Thanks for the question! I've put on bgg at https://boardgamegeek.com/thread/1610749/questions-about-knight-destiny-4ad.